Speaking with Regina B. Thomas, a resident who visited the hospital recently, she stated that the heat becomes very noticeable when the hospital gets very busy. "I was here in the morning and after waiting for about two hours, I had to start fanning with a book. Eventually, I went outside to get some cool breeze," said Ms Thomas. A member of staff who wished to remain anonymous, told our newsroom that when the lobby area gets crowded that is when you feel the heat. "Normally it would be cool even when there is a lot of people but now the heat is ridiculously hot and then the complaints begin," explained the staff member. 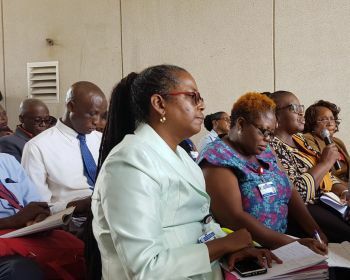 Meanwhile, in an invited comment from Chief Executive Officer (CEO) of the BVI Health Services Authority (BVIHSA) Paula G. Chester-Cumberbatch, she confirmed that the first and second floors of the hospital are experiencing some issues with the air conditioning units. "We have an issue with the AC on the first and second floor," while assuring that the floors that house the Ward and Emergency Unit are not affected. Ms Chester-Cumberbatch disclosed that the parts for the air condition units were ordered from a United States company and awaiting arrival. She explained, "Heat extractors and fans are used to make the areas cooler." Time for Doctor Smith to Make the switch....Picko Replace Myron...Ronnie Replace Picko...Myron Replace Ronnie. Way are they afraid of chance. Trying something different..
That's all the meteorologist has to say? Since Irma is bare weather report she sending.